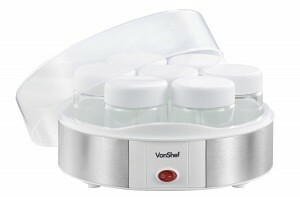 Vonshef are not necessarily a household name, so when you see their electric yogurt maker listed among the top sellers on online retailers, you could be forgiven for looking elsewhere for reviews, or being skeptical about the brand, but you needn’t be. 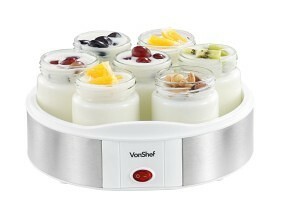 Vonshef’s electric yogurt maker is simple, affordable, and to be honest, quite brilliant! It does a great job for hobbyists and provides us with what we need to make loads of types of great yogurt. 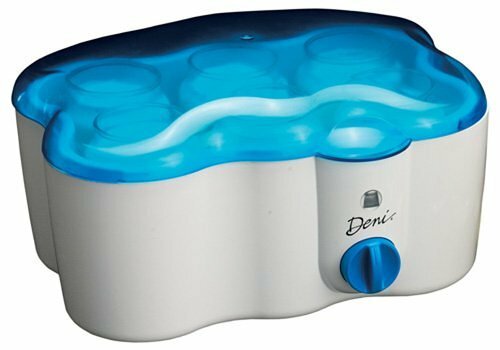 This machine comes with seven jars, all of which can be set to make yogurt at the same time, it means that you can experiment with your recipes if you so wish, and create a lot of different varieties for all of the family to enjoy. The looks of a product aren’t necessarily the main thing we look at, but you don’t want something that will make your kitchen look ugly, and this definitely doesn’t. A cool circular design and stainless steel housing make this look quite classy and modern, and would work well in any kitchen, fear not for your decor when purchasing the Vonshef! As already discussed, the seven different jars are a big plus point, allowing you to experiment with your recipes for the best yogurt. All of them have a 7 oz capacity, which is not small, and means you’re still managing to make a big enough batch even with the separate containers. A very cool feature is that this is only 15 Watts, which means it doesn’t use much power, which, when you consider that it could be on for 8-12 hours preparing your yogurt, is very good news for your energy! Very few yogurt makers end up costing a lot, and all will probably save you money vs store bought yogurt, but the Vonshef electric yogurt maker has the potential to be especially economical. The yogurt maker comes with clear instructions for use, which are based on the type of milk you are using. 8 Hours for whole milk, 10 hours for semi skimmed milk and 12 hours for skim milk. It is easy to follow, and though it doesn’t have an automatic timer (a feature which many yogurt makers do have) you can always set an alarm on your phone. Does this model have all the all-singing, all-dancing features that the top of the range yogurt makers offer? Perhaps not, but it has the benefit of being very simple, and very effective to use, as well as allowing you to experiment with different flavors, thicknesses and types of milk to use. This model has value on its side, usually available for a bit below its ticket price of $50. It doesn’t confuse with temperature settings and more, it is a plug in and go style model, which is perfect for most of us hobbyists or entry level yogurt makers. Most of the reviews on Amazon have given this model 5 stars, which tells you that it is great quality, and will probably do the job you need it to! Comes with our recommendation if you need simplicity, versatility and are looking to make several single serving yogurts in each use. A solid 8/10 which, considering the price, is mighty impressive. This entry was posted in Vonshef.